Do you like to shop at yard sales? Hoping to win the lottery for a quarter on someone else’s front yard? Well, it still happens when yard sale hosts don’t know what they are selling. Here are three true stories of yard sale finds that I discovered at my popular antiques appraisal events. If you are thinking of hosting a yard sale, you might want me, Dr. Lori Verderame a reputable appraiser with a Ph.D., to identify and value your items first so you don't become the loser in a future yard sale story published here in my blog. Also, be sure to read my 3 Yard Sale Selling Tips. Remember, these are real yard sale finds. 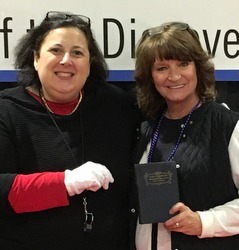 I met Angela at one of my many antique appraisal events at the Maryland Home & Garden Show near Baltimore, MD. Because of my popularity, mine is the only featured stage show to appear three or more times there. Angela tells the audience that she likes to yard sale shop and she bought this book for only one dollar at a local yard sale. I was happy to identify and value her rare copy of the Alice in Wonderland book that sells for 10,000 dollars. Yes, people pay that much. Plus, I was honest with Angela. Many resellers will tell her some wild story and “appraise” her book for 1,000 dollars and then offer to buy it from her. They usually offer around 10 percent of the actual value. Read the story I heard that supports this percentage. When this happens, the "appraiser" now just became a reseller, not an appraiser. This is not an appraisal, it is an offer to purchase. Learn about the 3 antiques values you must know. That reseller then turns around and sells it for 10,000 dollars—my appraised value. 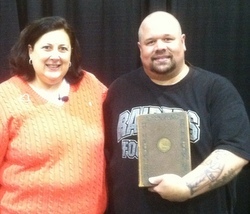 I met Kevin in Reno, NV at one of my events at the Reno Sparks Convention Center. He is an avid yard sale shopper like many of you and he bought a book for a few dollars at an area yard sale. Who hasn't done this? I was able to identify and appraise Kevin’s Masonic collectible as a rare copy of the 1927 edition of the Encyclopedia of Freemasonry about the famous secret society. See a close up of the title page so you know what to look for. I see sales records where people pay 500 dollars for these Masonic books. Couldn't happen to a nicer guy. Read my tips on how to find valuable Masonic collectibles. It's yard sale season and Luccaria who likes to shop and liked to negotiate at yard sales brought her religious icon discovery to one of my antiques appraisal events at the Pittsburgh Home and Garden show in Pittsburgh, PA. Watch me show her how easy it is to tell the piece is not Russian. She got the yard sale host down to 50 dollars and boy, was it worth it. I identified and valued her icon which she paid 50 dollars for at 1,500 dollars based on what I have seen others buy and sell them for. Of course, the sales records that I use to correctly value this icon didn’t occur at a yard sale. I always say a yard sale is one of the worst places to sell your stuff. Watch Luccaria tell you how she got the reduced price. If she can do it, so can you. Get ready for yard sale shopping season by reading my how to negotiate tips when shopping for antiques. As I said, the valuables are still out here for you to find at yard sales. I get a lot of push back from yard sale shoppers who get mad at me for revealing these finds but you need to know what to buy and what not to sell at a yard sale. I guess they think I’m going to stop them from getting bargains. No need to worry, since yard sale hosts continually put valuables out on their front yard without knowing, you'll find valuables there. All you need to do to avoid losing big bucks at your yard sale is to join me at one of my antique appraisal events and I'll show you how. Many of my events offer my expert evaluation at no charge. It's that simple.